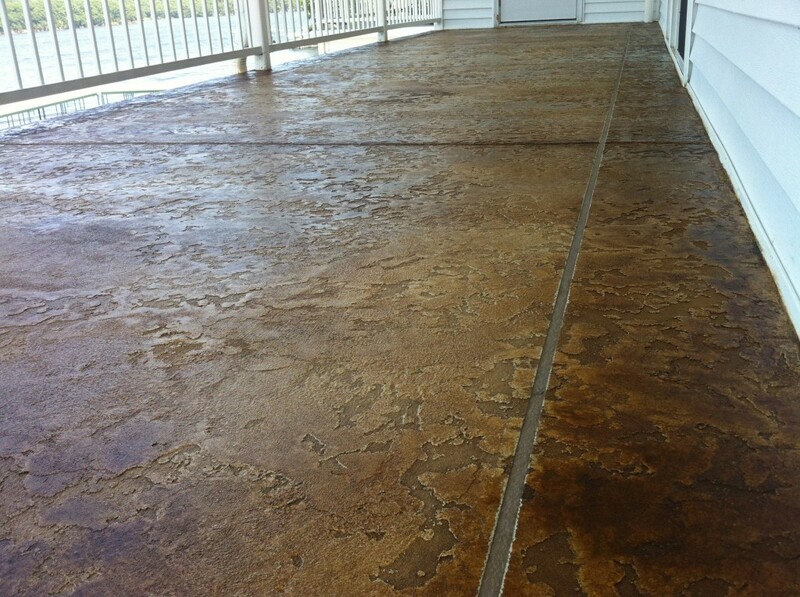 Started this Project with a good slab of concrete, it had some imperfections, like a few cracks we repaired, some light grinding, and it was a little wavey here and there, but overall it was in good shape. I started by addressing the cracks in the slab by opening up the cracks with my v-blade attached to my hand held 4 inch grinder, cleaned the crack out real well and repaired it. More info below the Video…. I came back in ground down some of the extra repair material, pressured washed, acid etched, ammonia rinsed and then pressure washed again, this concrete was repaired and thoroughly cleaned! The next Step was to start the overlay process, I began by laying out the first grout coat color, followed by the second grout coat color, we went with a medium tone Chocolate color for the grout. Once the grout coat was established the next day we came back in and taped out our 10inch boarder, then applied our tack coat over the tape with the grout coat to seal the tape and prevent any bleed under. (Blocks the top coat color since its a different color all together). Now we are ready for a different Color to lay over top of these 3 coats of concrete and the fiber tape that’s now embedded within the last layer of concrete. This coat is a light palomino color which is sort of a light greeish/beige color, but it look good as you can see in the Video above, its the same color as the Texture coat, which is next. ok now its ready for some texture, we apply the texture all with a trowel, which is very time consuming, this step took all day, well most of it. Ok so now we are ready to mask off the entire deck area, meaning the railing and the condo area, because the next step is Acid Staining the whole deck. Acid staining, ok here we go… 2 pump up sprayers one with acid stain (brown chem-stone cut 5 to 1) the other is for water to allow the acid stain to disperse evenly, first the water very lightly then spray some acid stain, this technique makes it feather out naturally, and marbleizes very nicely! I had to wait a few hours for the stain to react to the concrete overly, so I thought well why not hit the gym and kill a few hours, so I did… yes I was feeling a little like Rocky Balboa lol… anyway I came back pulled the fiber tape under my 3 coats of concrete, reveled my grout coat color and my 10 inch boarder came to Life! Last day was just to come in clean it all up real nice and start mixing the sealer, 1 st coat goes down very quick and the color just pops! !,,,the second coat really pulls it all together, locks it down and now its shining bright like a diamond, very nice gloss! !… This outside deck at Seascape Condo’s in Osage Beach, MO is now saved and will go on to live a very long and happy life! !